The Gallipoli Campaign during the First World War lasted from 25 April 1915 until 8 January 1916. It was fought on the Gallipoli peninsula forming one side of the Dardanelles Strait, part of the passage between the Mediterranean Sea and the Black Sea. The Ottoman forces under the strategic control of Germany opposed landings by forces of the British Empire and France. The geography and extended trench warfare at close quarters, coupled with rampant disease, made it an especially brutal affair. It was one of the greatest victories of the Ottoman Empire during that war and a major Allied failure. It is regarded as a defining event in the national histories of the Turkish Republic, Australia, and New Zealand. The military campaign is known by several names — the Battle of Gallipoli in Australia, New Zealand, South Africa, and Newfoundland; the Dardanelles Campaign in the UK, and the Battle of Çanakkale in Turkey. ANZAC Day, 25 April, is the most significant commemoration of military casualties and veterans in Australia and New Zealand. The battle is also a defining moment in modern Turkish history, the defense of the Turkish homeland as the old regime of the Ottoman Empire was in its final collapse. Gallipoli (or Gelibolu in Turkish) is a peninsula in European Turkey, forming the west side of the Dardanelles strait. 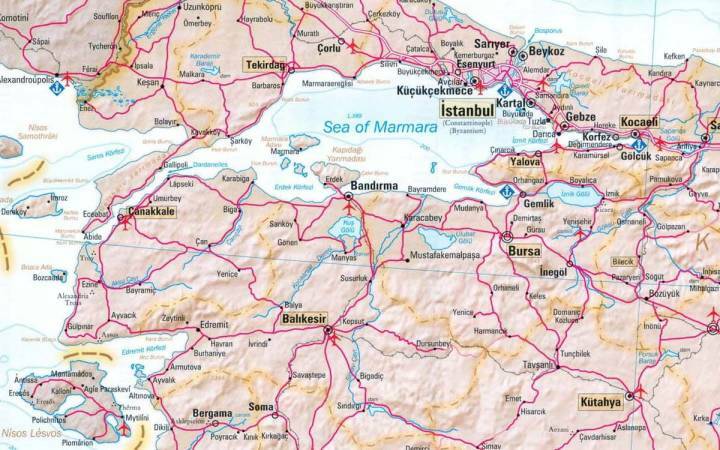 The Black Sea drains into the Aegean sea by passing through the Bosphorus, which divides İstanbul, and into the relatively small Sea of Marmara. From there, the water flows through the Dardanelles into the Aegean. 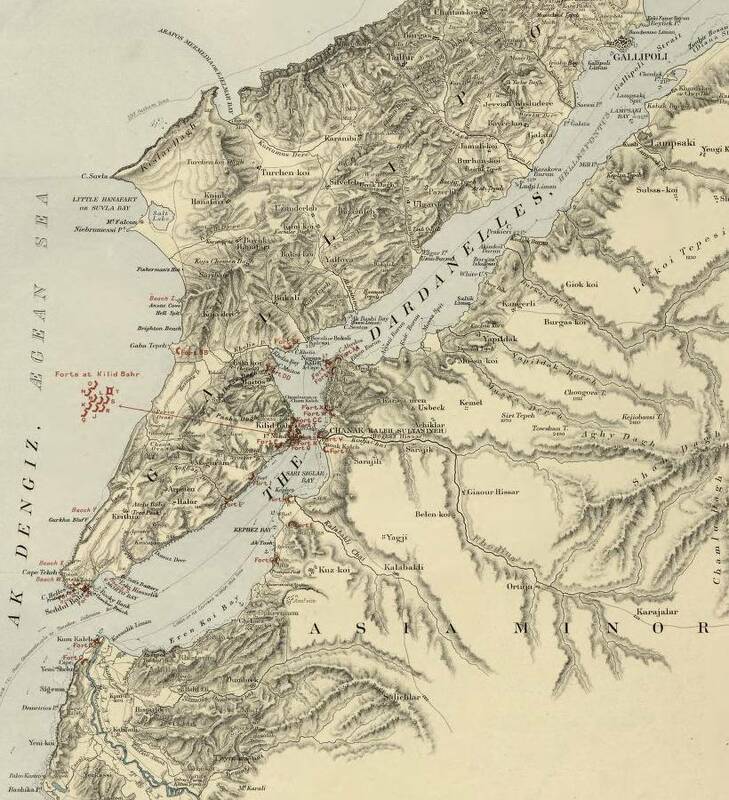 Both the Bosphorus and Dardanelles have enormous strategic value, as they are winding passages about a mile wide connecting the Mediterranean Sea and Black Sea. 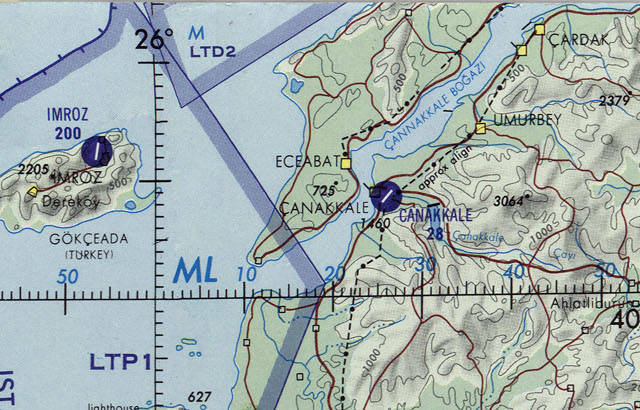 Çanakkale is the largest town in the area, and where you will probably stay overnight, although there are some services across the strait in Eceabat. 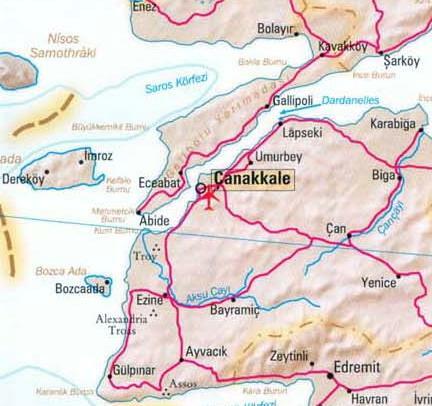 As for getting there by bus, Çanakkale is about 6 hours from İstanbul and 5 hours from İzmir. The peninsula's name comes from the Greek Καλλίπολις or "Beautiful City". The strait itself was the Έλλήοποντος or Hellespontos, the "Sea of Helle" (Helle, the daughter of Athamas, drowned here in the legend of the Golden Fleece). The peninsula was home to what the Greeks called "barbarian tribes" because they didn't speak Greek. Then settlers from Greece founded about 12 cities on the peninsula in the 600s BC. Just across the mouth of the Dardanelles strait on the Asian shore was Troy. The city of Troy was founded around 3000 BC and the site was occupied until around 500 AD. Historians date the Trojan War to the period 1260–1240 BC. Homer created his poems Iliad and Odyssey a few centuries later, in the 8th century BC. Yes, you can visit Troy. Be warned, though, it's the site of Troy, and if you are not well-informed about archaeology (or a real Troy fanatic!) you may be a little disappointed. Definitely start by seeing the Troy artifacts and the clear description of the site and its exploration in the archaeological museum in İstanbul. If you're interested in Troy, you might want to check out Mycenae, over in Greece, the home of the other side of the Trojan War. Troy became part of many nations' founding myths. Virgil's Aeneid describes the Trojan prince Aeneas as the ancestor of the founders of Rome. The Roman de Troie was a medieval retelling of the Trojan War, used to legitimize the European dynasties through a supposed connection via Rome to Troy. French royalty claimed a basis in King Priam of Troy. Geoffrey of Monmouth wrote of a connection from the legendary kings of Britain back to a mythic Brutus, descended from Aeneas. The Icelandic Prose Edda described the genealogy of mythological Norse figures back to individuals at Troy, with the generations establishing kingdoms across Europe as they moved northwest from Troy across Europe to Scandinavia. The Greeks abandoned the Gallipoli peninsula to the invading Persian army in 493 during the Greco-Persian Wars of 499-478 BC. It was recovered by the Greeks at the end of that war, and then was handed back and forth between the Athenians and the Spartans a few times. Phillip II of Macedon took control in 338 BC. After the death of his son Alexander the Great in 323 BC, Alexander's several successors fought over it. Eventually the Greeks enlisted the aid of the increasingly powerful Romans, who took control starting in 188 BC. That led to it being in the Eastern or Byzantine Empire run from Constantinople. Atilla the Hun invaded it briefly in 443 AD during the last stages of his European campaign. Then it was back in Byzantine control. The Byzantine Empire contracted over the centuries, and by the mid 1300s the Turks had moved from central Asia into Anatolia. The Greek city of Gallipoli was abandoned after a huge earthquake in 1354. The Turks crossed the strait and occupied the city, making it the first Ottoman possession in Europe. Russia had been expanding south for over 200 years. When Russian forces defeated the Ukrainian Cossacks and the Crimean Tatars and Circassians and took possession of the Ukraine and the Crimean peninsula, the Ottoman Empire no longer had a buffer zone between itself and the expanding Russian Empire. The Crimean War grew out of a religious dispute over which branch of Christianity should have control over holy sites in Palestine. The Ottoman Empire controlled Palestine as well as areas in today's Romania, Bulgaria, and Greece, all of those with Orthodox Christian populations. Russian saw itself as the protector of Orthodox Christians. But France wanted Roman Catholic control of the holy sites in Palestine. Both Britain and France were opposed to Russia gaining any power in the eastern Mediterranean, meaning that they wanted no Ottoman loss of power. They were willing to fight against Russia, even if it meant fighting on the side of the Ottoman Empire. The Ottoman Empire declared war on Russia in October 1853, and immediately suffered a naval defeat giving Russia control of the Black Sea. France and Britain joined the Ottoman Empire against Russia in March 1854. Most of the war was fought in the Crimean peninsula itself. 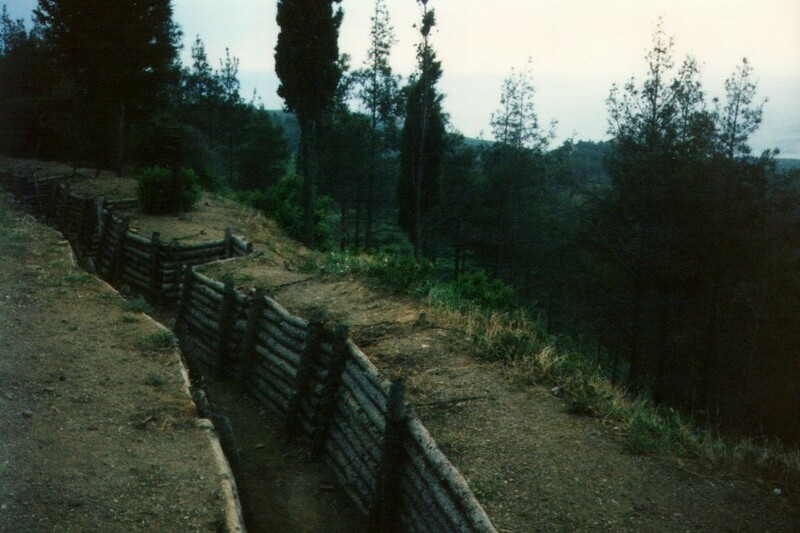 Gallipoli became a major encampment for British and French forces during the war. The Crimean War was one of the first major conflicts using modern military technology such as rifled barrels and the spin-stabilized Minié bullet, explosive naval shells, telegraph communication, and railroads for logistical support. It was also one of the first wars to be documented with photography. Florence Nightingale developed modern nursing techniques while treating the wounded. She organized a group of 38 volunteer nurses that she had trained, and led them to to İstanbul, to the Selimiye Barracks in Üsküdar on the Asian side of the Bosphorus. They found overworked medical personnel, overcrowding, a lack of medication and food, and bad hygiene leading to widespread fatal infections. In the first winter, the number of soldiers dying from typhus, typhoid, cholera, and dysentery was ten times the number dying from battle wounds. The Crimean War ended with the Treaty of Paris on 30 March 1856. Russia returned the city and fortress of Kars as well as the principalities of Moldavia and Wallachia to the Ottoman Empire. In practical terms both Moldavia and Wallachia, now parts of today's Romania, became independent. The Ottoman Sultan and the Russian Tsar pledged not to build any naval or other military arsenals on the Black Sea coast, and the Great Powers pledged to respect the territorial integrity and independence of the Ottoman Empire. All that lasted until 1871 and the defeat of France by Prussia in the Franco-Prussian War of 1870-1871. From there, pressure continued to build up toward the First World War in 1914, when France and Britain were now allied with Russia against the Ottoman Empire. World War I came to Gallipoli in 1915. The Young Turks movement had deposed Abdul Hamid II, known as the Red Sultan or Abdul the Damned because of his widespread pogroms and massacres. During 1894-1896 the "Hamidian Massacres" (or ​​​​​Համիդյան ջարդեր​​​​​ in Armenian) killed between 200,000 and 300,000, primarily Armenians but also including 25,000 Assyrians. Photography and telegraphy allowed for extensive coverage in western Europe and the U.S. The Young Turks deposed Abdul Hamid II in 1909 and placed Mehmed V on the throne, largely as a figurehead. The new regime announced a program of reform, and Germany stepped into the political vacuum. On 30 July 1914, two days after the First World War had begun in Europe, the Ottoman Empire formed a secret alliance with Germany against Russia. Command of the Ottoman navy was taken over by Rear Admiral Wilhelm Souchon of the Imperial German Navy. On 31 October 1914, the Ottoman Empire openly entered the war on the side of the Central Powers, Germany and Austria-Hungary. France and Britain declared war on the Ottomans, and the British landed at Ottoman-controlled ports on the Persian Gulf to seize the oil facilities. The Ottomans began a military offensive in the Caucasus to regain former Turkish provinces from Russia, and they planned to attack Egypt in early 1915 to seize the Suez Canal and cut the connection from the Mediterranean to India and East Asia. Toward the end of 1914 the war along the Western Front had become a stalemate with trench warfare along a line of fortifications running from Switzerland to the North Sea coast. Any fighting on the Eastern Front would relieve pressure on the Western Front, but Germany and Austria-Hungary blocked overland passage to Russia, the Imperial German Navy controlled the Baltic, and the Russian ports on the White Sea in its northwest and the Sea of Okhotsk in the far east were blocked by ice much of the year. Plus Vladivostok was about a third of the way around the world from Moscow across the world's largest country. Now the Ottoman Empire had blocked the passage through the Dardanelles and Bosphorus to the Black Sea and Russian warm-weather ports. By late 1914 the Western Front through France and Belgium had become static and a new front was needed. The Allies also hoped that if they attacked the Ottoman Empire, Greece and Bulgaria might be drawn into the war on the Allied side. Winston Churchill was the First Lord of the Admirality, and he presented plans for a naval attack based on three sets of assumptions. First, that the Royal Navy had a large number of obsolete war ships not useful against the German High Seas Fleet in the North Sea, but they might be useful in another naval theatre. Second, that Turkish troop strength was low, an incorrect assumption based on erroneous reports from T.E. Lawrence. The equally wrong third assumption was that the decline of the Ottoman Empire meant that their troops would be apathetic. At least the British did have those obsolete ships. That one out of the three assumptions was correct. Naval operations started on 19 February 1915 with a naval bombardment of Turkish artillery installations. Allied assumptions were incorrectly optimistic. Admiral Carden sent a cable to Churchill on 4 March stating that the fleet could expect to arrive in Constantinople (as İstanbul was still called) within fourteen days. The Allies also intercepted a German wireless message reporting that the Ottoman Dardanelles forts were about to run out of ammunition. The Allies launched the main attack was launched on 18 March. A fleet of 18 battleships and many cruisers and destroyers targeted the narrowest point where the Dardannelles are just a mile wide. The Allies were unaware of the extent of the Ottoman naval mines, and several ships were lost or heavily damaged. The intercepted German message had been correct. 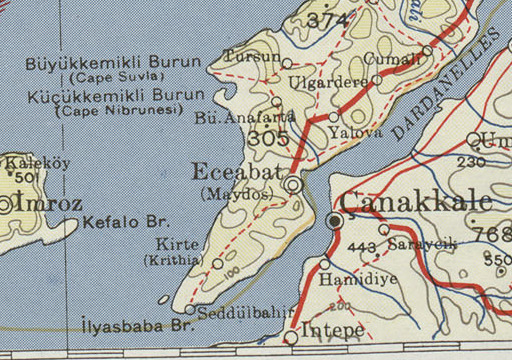 The Turkish artillery had almost run out of ammunition before the fleet retreated. The result was a change of strategy for the Allies and a huge morale boost for the Turks. The debate continues — what would have happened if the fleet had pushed on as Churchill had demanded? Maybe Gallipoli would not have been a defeat for the Allies, or maybe the entire fleet would have been lost after getting into the Sea of Marmara but then being unable to either take Constantinople or retreat through the mined Dardanelles. 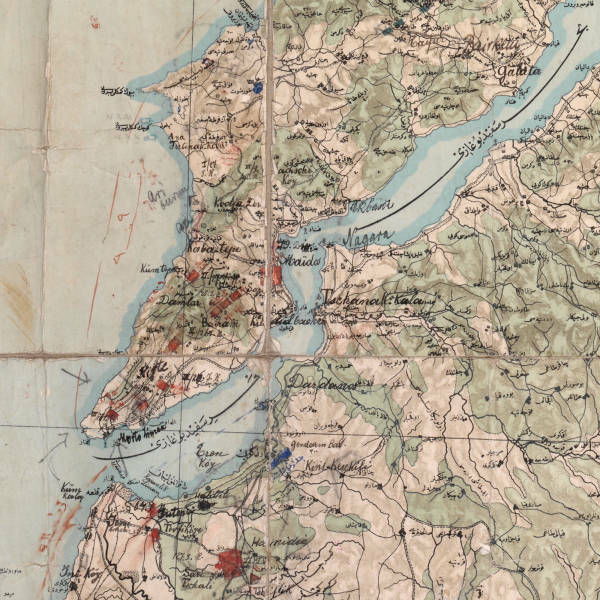 This map is Turkish and marked with the Ottoman Turkish script, with some hand-written annotations in English. The Ottoman Fifth Army was assigned to defend the strait. It was commanded by Otto Liman von Sanders, a German military officer. Many of the senior officers were also German. The first map here shows the defenses that were put into place. Forts and artillery batteries had been built along the coasts. An anti-submarine net and eleven belts of mines had been deployed in the strait. Allied command decided that ground forces would have to eliminate the Turkish mobile artillery. 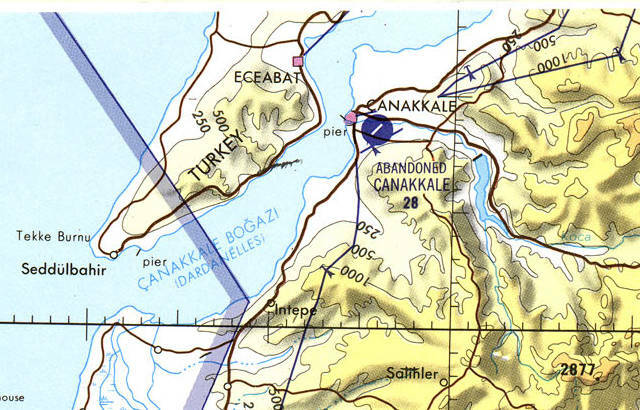 The second map above shows the planned landings on the Gallipoli peninsula. The larger landing force would come ashore along what came to be called the Helles sector at the tip of the peninsula. Forces would include the British 29th Division, the Royal Naval Division (Royal Marines and naval recruits), and the French Oriental Expeditionary Corps, including four Senegalese battalions. ANZAC (Australian and New Zealand Army Corps) forces comprised the Australian 1st Division and the New Zealand and Australian Division. The ANZAC landing sector was to be north of Helles along the western coast. Diversionary movements would be made toward the neck of the peninsula and the Asian coast around Troy and to the south. The ANZAC forces were fairly close in Egypt, but there was a delay of six weeks while troops were shipped from Britain, allowing Turkish forces time to prepare for the land assault. Roads were constructed, beaches were wired and mined, and trenches and gun emplacements were dug. The high ground was fortified. The invasion began on 25 April 1915. All the landings went from bad to worse, and quickly settled into deadly static sieges. 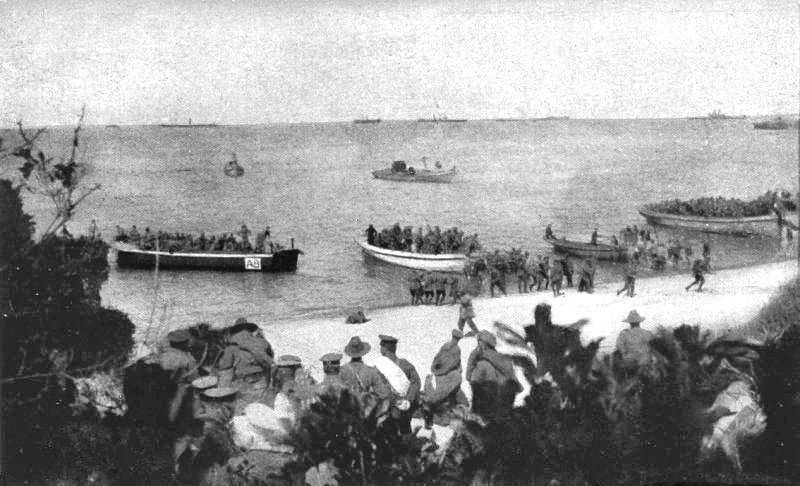 The ANZAC landing was at night, and they came ashore about a mile north of the intended landing beach. Instead of an open beach, there was just a very narrow beach immediately leading to cliffs and steep slopes to the ridgeline some 300 feet above. The assaulting formations became disorganized and the plans were discarded. By nightfall there was a beachhead, but it was much smaller than planned and many units were in entirely unprotected locations. Of the 16,000 men in the ANZAC forces, about 900 had been killed and another 2000 wounded. Anzac Beach at 8 AM on 25 April 1915. 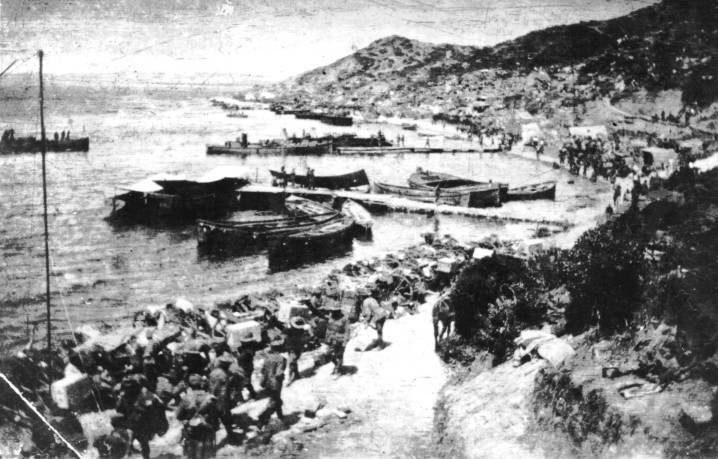 Anzac Cove after the landing. New Zealand soldiers at Anzac Cove. 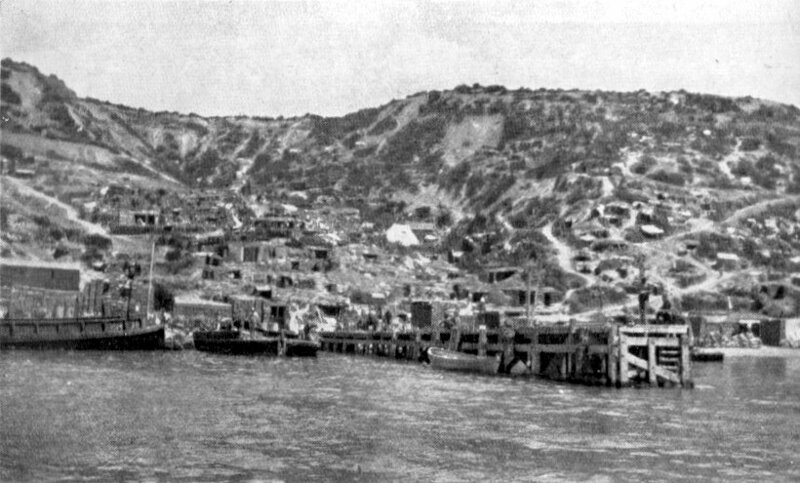 Anzac Cove shortly after the landing. 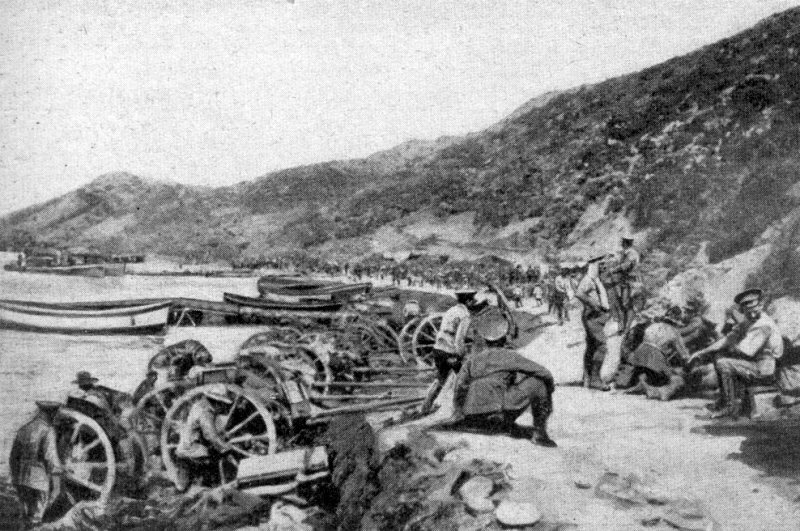 Watson's Pier at Anzac Cove. "I do not command you to fight, I command you to die. In the time it will take us to die we can be replenished by new forces." Every man in the 57th Infantry Regiment was either wounded or killed. To commemorate this, the Turkish Army no longer has a 57th Regiment. 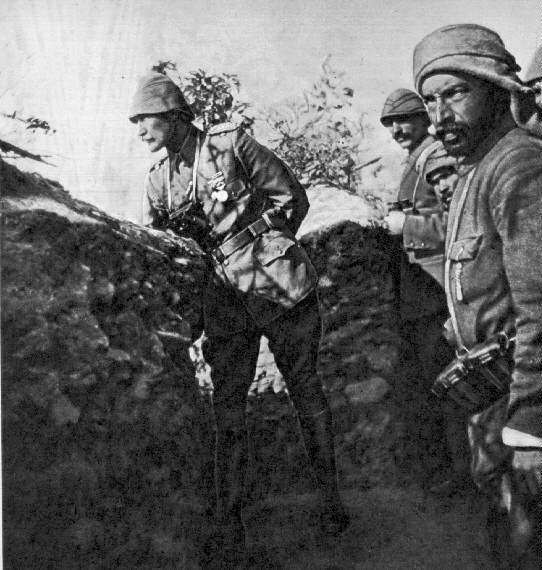 Here you see Mustafa Kemal in Ottoman trenches at Gallipoli. Mustafa Kemal was promoted to Pasha, and he went on to lead the establishment of the Turkish Republic. Now, of course, he is known as Kemal Atatürk. 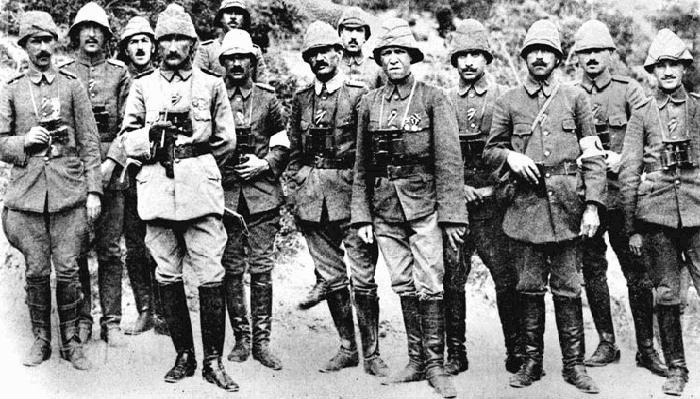 Mustafa Kemal at Gallipoli, 4th from left. The losses were horrible on both sides. 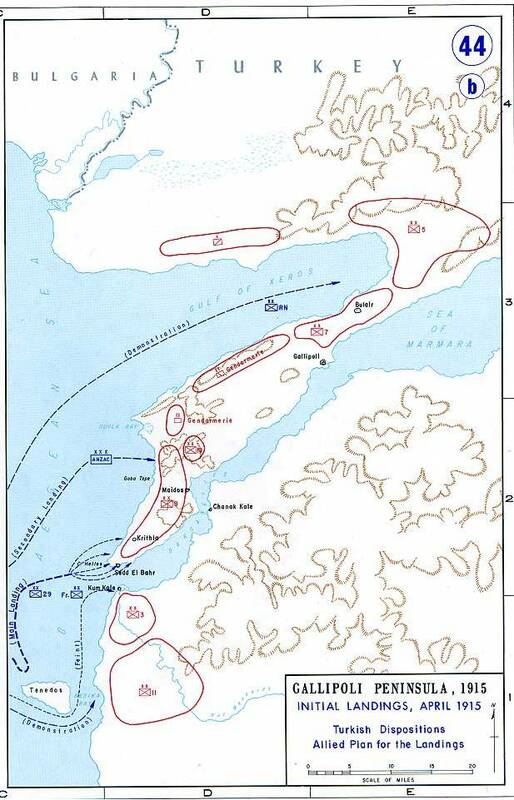 On 19 May the Ottoman forces began an attack with 42,000 men, attempting to push the 17,000 ANZAC troops back into the sea. The Turks suffered about 3,000 deaths and 10,000 wounded, with ANZAC losses at 160 killed and 468 wounded. This put an end to Ottoman frontal assaults, and the ANZAC sector was mostly small skirmishes with exchanges of grenades and sniper fire. In August the Allies began unsuccessful offensives to take high points. Despite a few initial successes, all ultimately failed. Then in the following month Allied divisions were being pulled away for the campaign at Salonika. Conditions through the summer had been awful for both sides, with heat, nearly non-existent sanitation, and many unburied bodies in addition to the poor positions of Allied bases. Dysentery and other diseases caused many deaths on both sides. Then as autumn led into winter, the heat was replaced with gale winds and flooding, followed by blizzard conditions in late November and into early December. Many men drowned in the trenches, and there were thousands of frostbite cases. Meanwhile, Bulgaria had entered the war on the side of the Central Powers in October, providing an overland route for Germany to supply heavy artillery which began pounding the Allied trenches. This had led to the Allies pulling some divisions away for the new front at Salonika, facing Bulgaria to the north. The allied forces were all withdrawn from the ANZAC sector through through December, starting on the 7th and with the last troops leaving before dawn on the 20th. The Helles sector was evacuated before dawn on the 8th of January. The campaign was largely successful for the Turks and the Germans, and a significant defeat for the Allies. As for Russia, it was a strategic catastrophe. It was part of the reason for the civil war and Russian Revolution, overthrowing Imperial Russia and establishing the Soviet Union. And the Ottoman Empire collapsed with the end of World War I, and the modern Turkish Republic was established. The Ottoman royal family was exiled, and the last man who would have been the Ottoman Sultan died in 2009 after living in Manhattan since 1939. There were many casualties — 180,000 Allied and 220,000 Turkish. It was a major turning point for Australia, New Zealand, and Turkey. It nearly ruined the career of Winston Churchill, who had designed the Dardanelles invasion plans as First Lord of the Admiralty. 25 April is now observed as ANZAC Day, with large crowds gathering at Gallipoli. The book Military Misfortunes: The Anatomy of Failure in War by historians Eliot Cohen and John Gooch presents the Gallipoli campaign as a textbook example of a military failure caused by overconfidence. It would start with a large-scale amphibious landing, a complex military operation with which the British had little experience. It would immediately involve combat against an opponent dug into a harsh and hilly landscape of rocky outcroppings and ravines, what they call "one of the finest natural fortresses in the world." The British military leaders had estimated that the Allied forces would need at least 150,000 troops with 300 artillery pieces to take Gallipoli. However, the British leadership never drew up a formal plan of operations. They sent only 70,000 troops and 118 artillery guns, including almost no howitzers or trench mortars. Despite the anticipated trench warfare, almost no grenades were sent. Command of the crucial landing at Suvla Bay was assigned to Frederick Stoppard, a retired officer with mostly administrative experience. 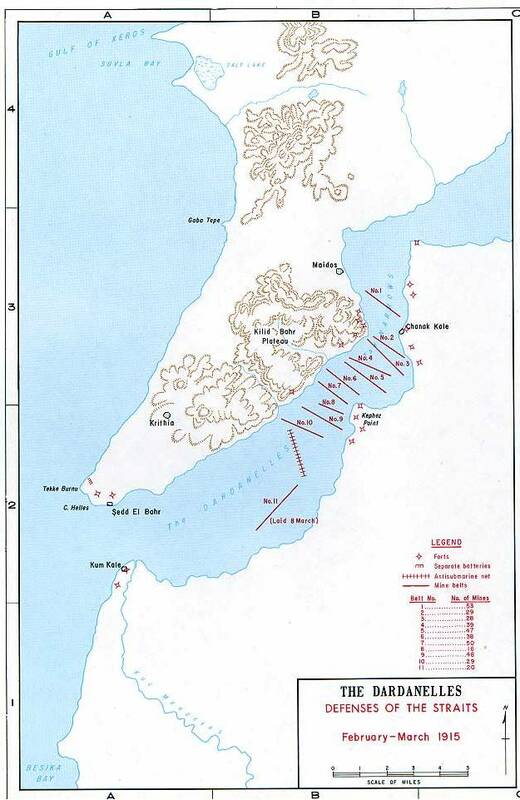 The British commander Sir Ian Hamilton eventually stepped in to take command at Suvla Bay. Before the battle he had written in his diary, "Let me bring my lads face to face with Turks in the open field. We must beat them every time because British volunteer soldiers are superior individuals to Anatolians, Syrians or Arabs and are animated with a superior ideal and an equal joy in battle." This was the first modern amphibious landing, and it has been studied ever since. The analysis of this campaign led to the belief that amphibious landings could not succeed against modern defenses, and that in turn led to the meticulous planning and enormous scope of the 1944 Normandy landings. 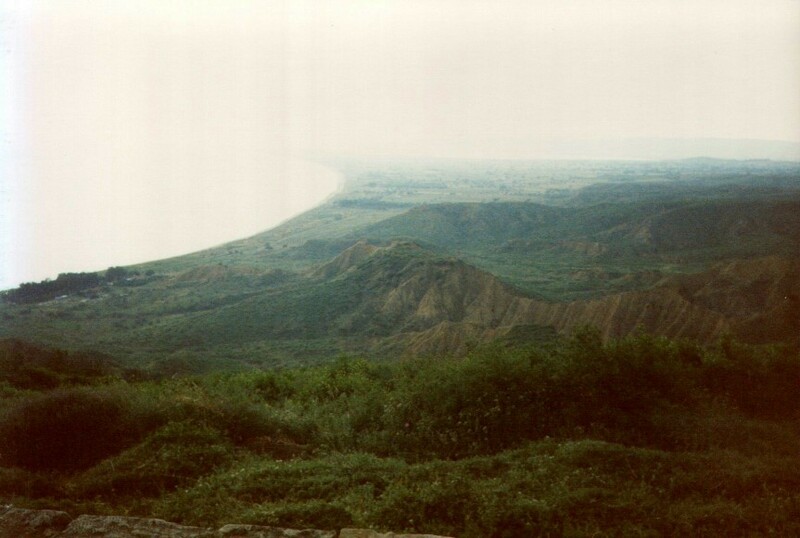 This is a view looking down from the high ground, from above Anzac Cove down toward the Aegean shore. The Allies were forced to attempt to fight their way up high steep slopes. 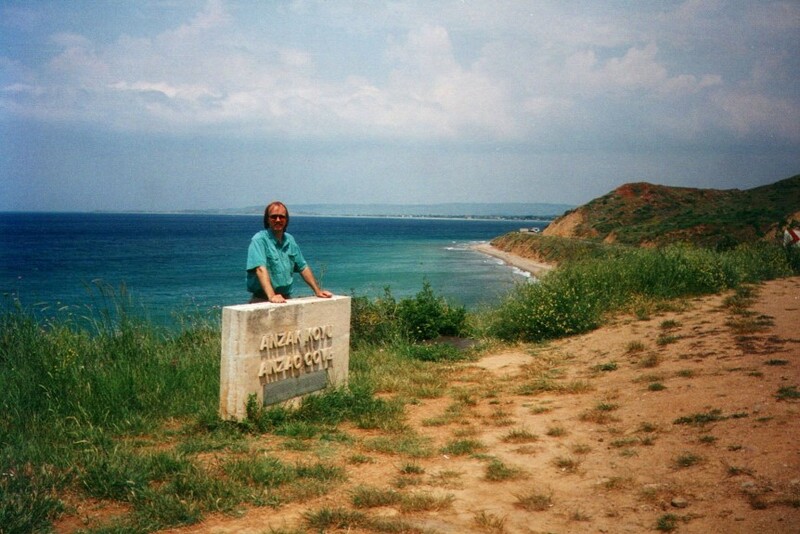 Below, I'm at the marker above Anzac Cove. The cove itself is surprisingly small. Many of the guesthouses in Çanakkale show both a documentary on the battle and Mel Gibson's early movie "Gallipoli" every night. The movie is a good introduction to the history! But even after watching both of those, Anzac Cove is surprisingly small. 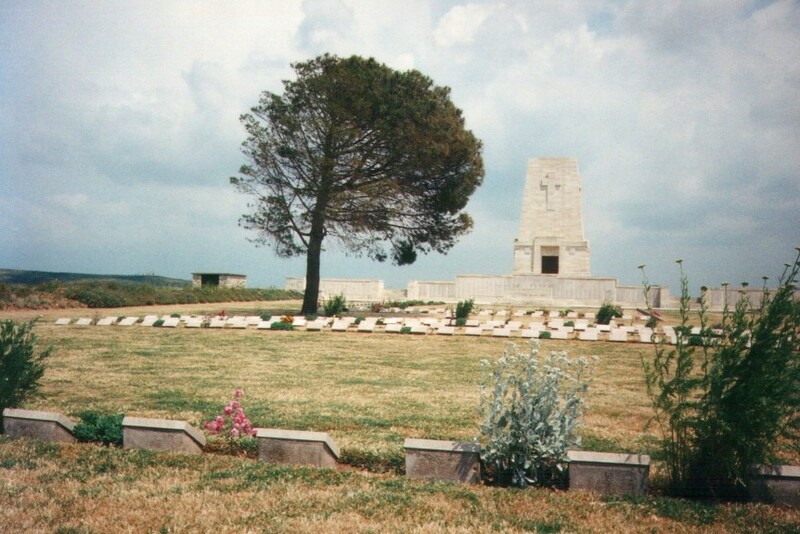 These are two of the many cemeteries at Gallipoli. The Commonwealth War Graves Commission or CWGC maintains cemeteries for all British Commonwealth forces. 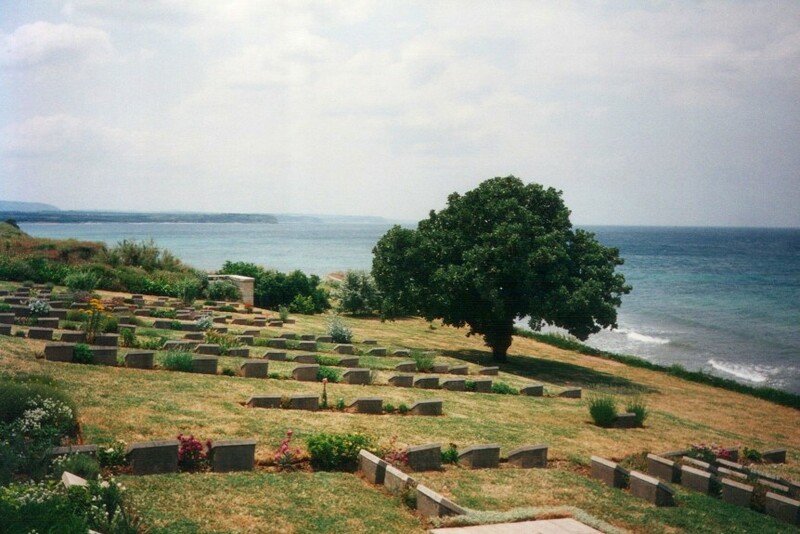 There are 31 CWGC cemeteries at Gallipoli — 21 in the ANZAC sector, 6 at Helles, and 4 at Suvla. Plus, two more CWGC cemeteries on the nearly Greek island of Limnos. 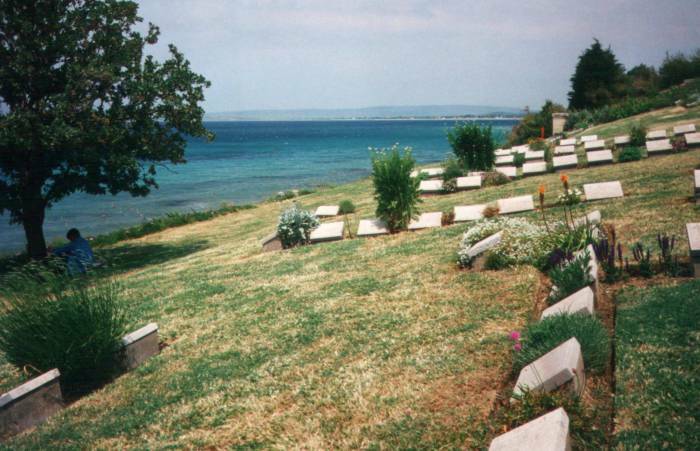 There is only one French cemetery at Gallipoli, at Seddülbahir. Those heroes that shed their blood and lost their lives... you are now lying in the soil of a friendly country. Therefore rest in peace. There is no difference between the Johnnies and the Mehmets where they lie side by side here in this country of ours. You the mothers who sent their sons from far away countries, wipe away your tears. Your sons are now lying in our bosom and are in peace. Having lost their lives on this land they have become our sons as well.